The past two weeks have been absolutely beautiful weather wise. So much so that I’ve really been craving fresh, springtime meals. When strawberries are in abundance (which they were thanks to my CSA with Lazy Eight Stock Farm), making strawberry yogurt is a no brainer. 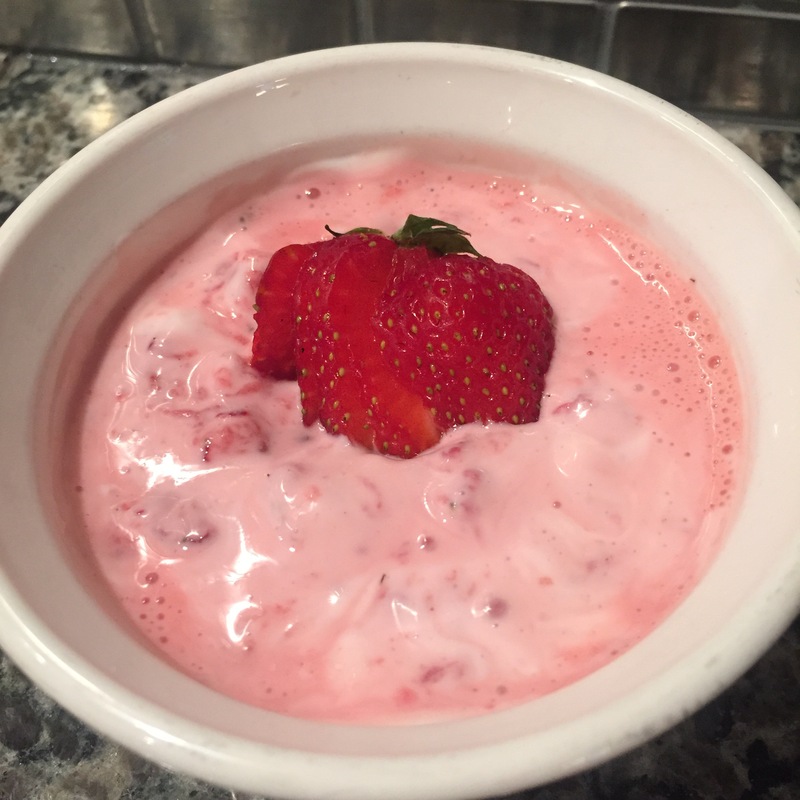 No need to buy store bought strawberry flavored yogurt with added sugar and other questionable ingredients when you can easily make your own Strawberry Greek Yogurt. When spring veggies are easily accessible from your local farmer, fresh and easy meal are doable in about 20 minutes. This is particularly true when you add other quick ingredients like whole grains and cheese. 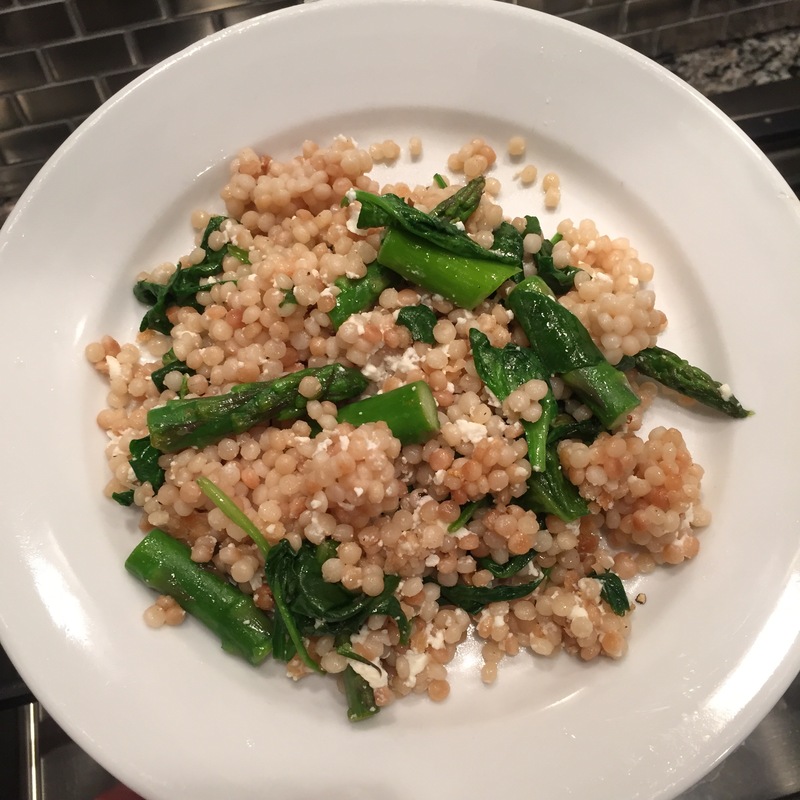 That’s exactly what you’ll get with the Couscous Lemon Salad with Spinach Feta and Asparagus. 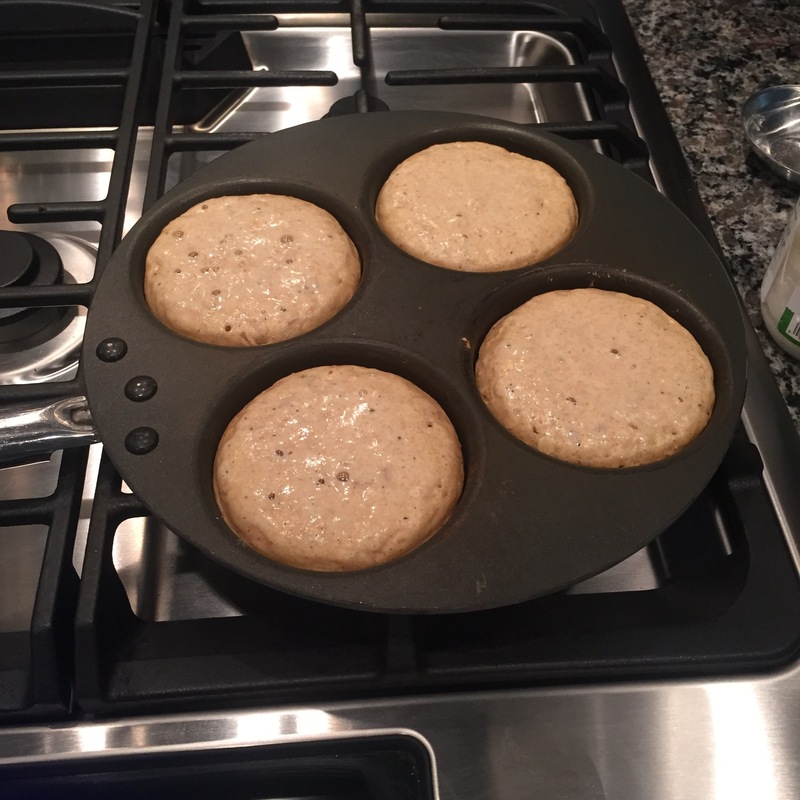 Another meal that deserves some talk time is the Buttermilk Oat Soaked Pancakes. These are consumed quite often on weekends at my house. However, let us not forget that breakfast for dinner is always a good idea. This go round, I substituted buttermilk for regular milk. Buttermilk helps keep pancakes light and fluffy, and it adds a slight tang to the batter that goes great with pure maple syrup. Directions: To a single serving bowl, add the strawberries and mash them with a fork. Add the remaining ingredients and stir. Sweeten to taste with a bit more honey, if needed. Enjoy! Directions: In a small bowl, combine the dry ingredients. In a larger bowl, stir together the wet ingredient. Add the dry ingredients to the wet ingredients, stirring just until combined. Cool in the refrigerator for at least 30 minutes. Preheat oven to 325 degrees. 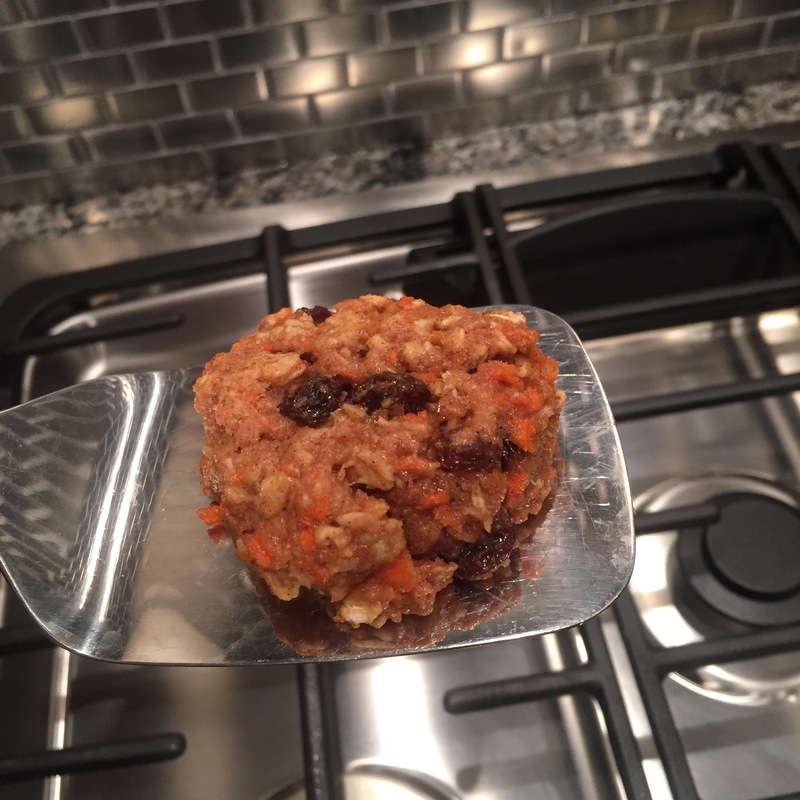 Scoop cookies into 15-16 rounded mounds on a silicone lined baking sheet or baking stone. Bake for 12-15 minutes. Edges will be slightly browned. Allow to cool before eating or they tend to fall apart. Directions: Preheat oven to 350 degrees. 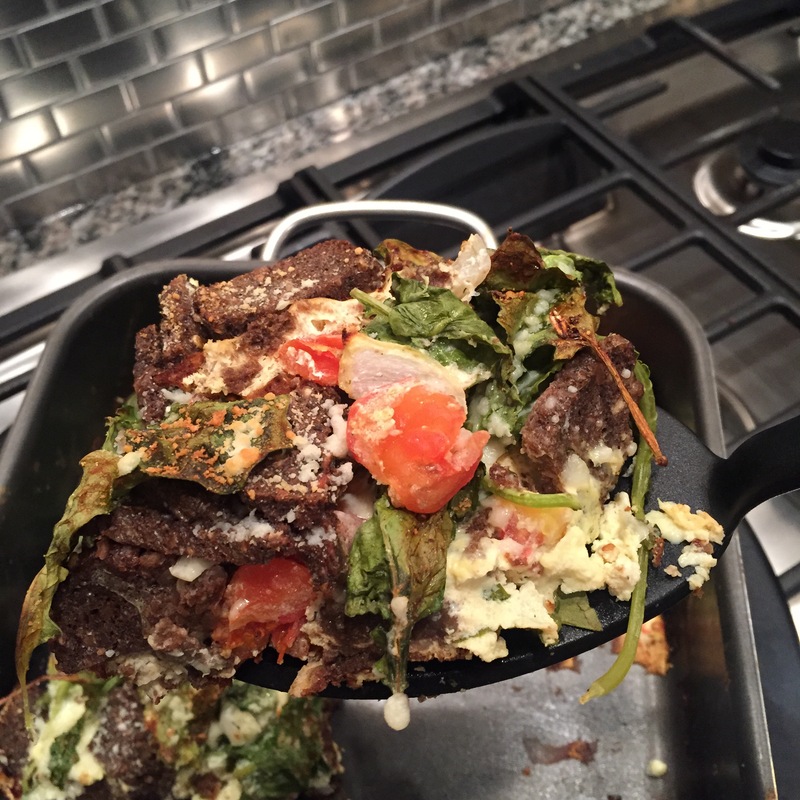 In a 9×12 baking dish, mix together the kale, tomatoes, onion, and bread. In a small bowl, whisk together the eggs, milk, yogurt, garlic, dill, black pepper, and garlic powder. Evenly pour the liquid over the kale mixture. Bake for approximately 30-35 minutes or until the egg mixture has firmed up (it shouldn’t jiggle when you wiggle the pan). Remove from the oven and evenly top with the Parmesan cheese. You could eat it as is…or, you could add some salsa and/or a few dashes of hot sauce. If you’re feeling really adventurous, add a dollop of Greek yogurt along with the salsa and/or hot sauce. Directions: In a large bowl, add the homemade buttermilk. Stir in the oats, eggs, vanilla, and honey. Allow to sit at least 5 minutes. In a smaller bowl, combine the dry ingredients. Add the dry ingredients to the wet ingredients. Gently stir to combine, being careful not to over stir. Lightly grease the skillet with an oil of your choosing (we like coconut oil or organic butter). Top with pure maple syrup or a thin layer of creamy almond butter. Directions: In a small saucepan, add the balsamic vinegar and coconut palm sugar. Bring to a low boil and then reduce to a simmer. Allow to simmer for about 15-20 minutes, stirring occasionally. It will reduce by about one-half and thicken to a maple syrup consistency. Tip: Put the cut watermelon in a strainer while preparing the salad to drain some of the excess liquid. While the vinegar is simmering, season both sides of the chicken with the dry seasoning. Pan sear or grill until cooked thoroughly. Remove the chicken from the heat. Cover and allow to rest for at least 5 minutes. Cut the chicken into bite sized pieces. 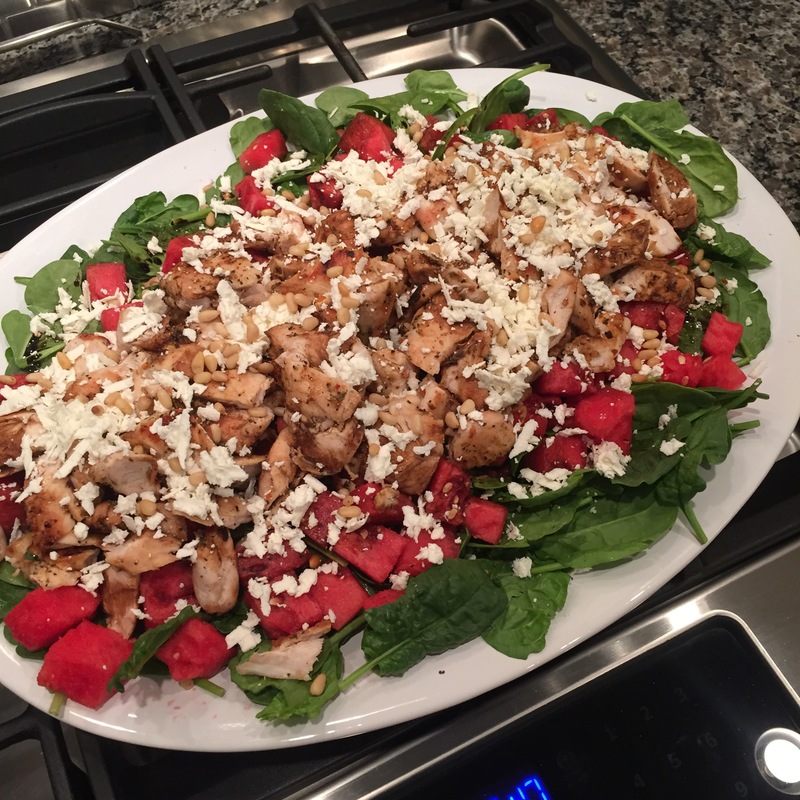 To a large serving bowl, layer the spinach, watermelon, chicken, cheese and nuts. Drizzle with the balsamic reduction to taste. Another tip: Double the recipe to serve 6-8 people.